I’ve been pondering this topic for quite some time now. I’ve sat back and watched as decisions or agendas from our nations highest level have been pushed out to schools around the nation. Now, I’m vested in education with my mind, body, and soul. I’m vested in education with the countless hours of training and prep in my post secondary and masters programs. I’m vested in education with the thirteen years I’ve spent within the walls of schools. As somebody that has dedicated their life to education – I struggle to understand the direction in which we are headed (especially now as talks surrounding School Choice continue to dominate discussions). I struggle to understand why politics often drive instruction in our schools. As a matter of fact, politics should never influence education, rather it is education that should influence politics. Below you will find 7 reasons why I believe politics can disrupt education. I’d love to hear your thoughts and I totally agree that laws should be made to protect all people – I’m really just referring to the “meat” and the “how to” in this post. I know many legislators that are advocates for students and teachers and I’m thankful for each of them and the work they do. Many have brought legislation that has truly impacted children in a positive way. However, it is beyond the state level where I believe politics has entered education in a negative way. It’s not about Republicans, Democrats or other political parties. It’s about students. It’s not about money or favors. It’s about love and nurture. It’s not about special interests. It’s about student interests. It’s not about laws or legislative acts. Actually there are zero laws, measures, or acts that ensure children will learn. If you want students to learn – you can’t script it in law – it must be scripted in the hearts and minds of our students. And if we have to make it law to love – we’ve lost all hope. 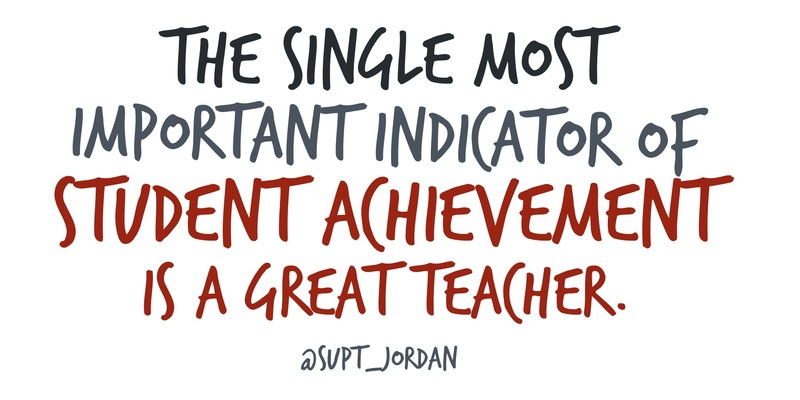 The single – most important indicator of student achievement is a great teacher, not a law or mandate. As a school superintendent – I’d never tell NASA how to do something. We have some amazing teachers in this country – let’s trust their decision making. One size will never fit all in education. I kindly ask that we stop trying to politicize education at the national level. We have amazing educators doing wonderful things in our classrooms around the nation. No matter what rhetoric is used, and from what level it comes from – you will never ever surpass the value, importance, and inspiration of a great teacher.